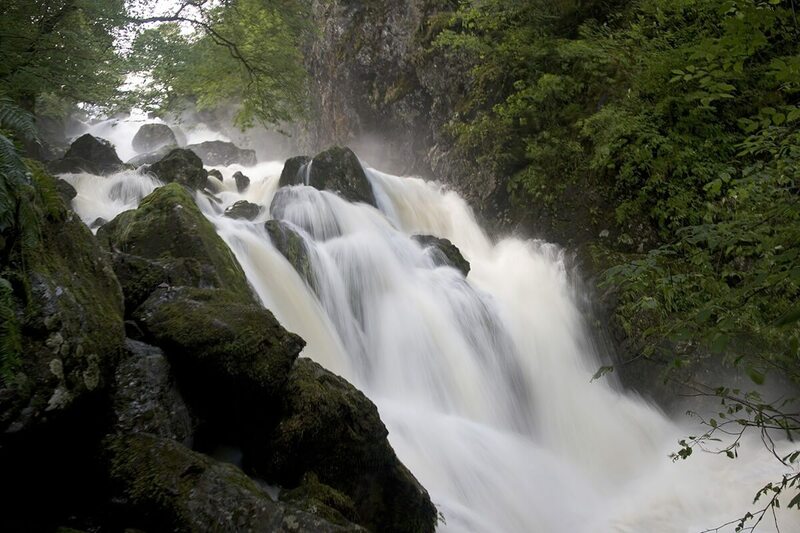 Lodore Falls – Keswick Launch Co.
Popular waterfall tumbling more than 100 feet from Watendlath. Spectacular on rainy days. The Lodore Falls is where the beck that flows down the hanging valley of Watendlath tumbles over the edge into Borrowdale. This cataract is best seen after rain, but is worth seeing at any time. Access is by a gate from the road near the Lodore Hotel. Access may also be made from the road above, Ashness Road which leads to Watendlath. The main drop of the falls is about 28 metres, or 90 feet. The Lakeland poet, Robert Southey wrote his famous poem ‘The Cataract of Lodore’ in 1820 about the falls. Stop at Lodore. 15 mins walk from jetty. Perhaps the most photographed packhorse bridge in the Lake District due to its stunning views. Lingholm has a strong connection with Beatrix Potter who spent many holidays on the Estate. A modern sculpture to commemorate the Centenary of the National Trust in the Lake District.